"Women unconsciously tie price setting to self esteem and self respect," says Kirsten Osolind, a marketing consultant who specializes in branding to women and a former Public Policy Chairperson for the National Association of Women Business Owners. "Many women fear rejection and think a lower price will yield more sales and longer-term relationships. But what customers pay for are value, brand and results." Women take home lower pay as employees--on average, 77 cents for each $1 a man earns. But self-employed women are underpaying themselves too. Studies show that women typically set their own rates lower than their male counterparts. The 2006 study by researchers in Texas and California, "Behavioral Study of Pricing Decisions: A Focus on Gender," found that women were softer on their prices in an effort to foster client relationships. An earlier study by the Society for the Advancement of Education found that men working from home earned an average of $45.29 an hour, while women with similar educations and business experience earned just $17.29 per hour. 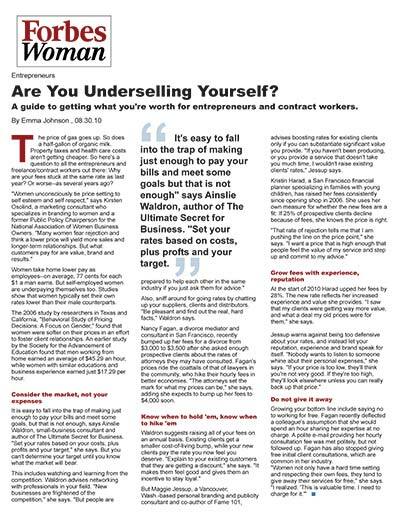 It is easy to fall into the trap of making just enough to pay your bills and meet some goals, but that is not enough, says Ainslie Waldron, small-business consultant and author of The Ultimate Secret for Business. "Set your rates based on your costs, plus profits and your target," she says. But you can't determine your target until you know what the market will bear. This includes watching and learning from the competition. Waldron advises networking with professionals in your field. "New businesses are frightened of the competition," she says. "But people are prepared to help each other in the same industry if you just ask them for advice." Also, sniff around for going rates by chatting up your suppliers, clients and distributors. "Be pleasant and find out the real, hard facts," Waldron says. Nancy Fagan, a divorce mediator and consultant in San Francisco, recently bumped up her fees for a divorce from $3,000 to $3,500 after she asked enough prospective clients about the rates of attorneys they may have consulted. Fagan's prices ride the coattails of that of lawyers in the community, who hike their hourly fees in better economies. "The attorneys set the mark for what my prices can be," she says, adding she expects to bump up her fees to $4,000 soon. Waldron suggests raising all of your fees on an annual basis. Existing clients get a smaller cost-of-living bump, while your new clients pay the rate you now feel you deserve. "Explain to your existing customers that they are getting a discount," she says. "It makes them feel good and gives them an incentive to stay loyal." But Maggie Jessup, a Vancouver, Wash.-based personal branding and publicity consultant and co-author of Fame 101, advises boosting rates for existing clients only if you can substantiate significant value you provide. "If you haven't been producing, or you provide a service that doesn't take you much time, I wouldn't raise existing clients' rates," Jessup says. Kristin Harad, a San Francisco financial planner specializing in families with young children, has raised her fees consistently since opening shop in 2006. She uses her own measure for whether the new fees are a fit: If 25% of prospective clients decline because of fees, she knows the price is right. "That rate of rejection tells me that I am pushing the line on the price point," she says. "I want a price that is high enough that people feel the value of my service and step up and commit to my advice." At the start of 2010 Harad upped her fees by 28%. The new rate reflects her increased experience and value she provides. "I saw that my clients were getting way more value, and what a deal my old prices were for them," she says. Jessup warns against being too defensive about your rates, and instead let your reputation, experience and brand speak for itself. "Nobody wants to listen to someone whine abut their personal expenses," she says. "If your price is too low, they'll think you're not very good. If they're too high, they'll look elsewhere unless you can really back up that price." Referrals, media mentions and a powerful online presence including high Google ranking and a polished website are essential to justifying rate jumps, Jessup says. Growing your bottom line include saying no to working for free. Fagan recently deflected a colleague's assumption that she would spend an hour sharing her expertise at no charge. A polite e-mail providing her hourly consultation fee was met politely, but not followed up. Fagan has also stopped giving free initial client consultations, which are common in her industry. "Women not only have a hard time setting and respecting their own fees, they tend to give away their services for free," she says. "I realized: 'This is valuable time. I need to charge for it.'"